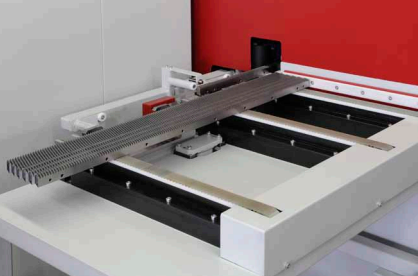 The ZEM automatically deburr rack teeth after the grinding process. For this purpose the racks pass round brushes on both sides of the toothed area. These remove the burr without reducing the quality of the surface. The wear of the brush is continuously adjusted to achieve a constant result during deburring. The basic machine consists of a stable welding construction with suction of the grinding dust. The brushes can be adjusted to the inserted racks. 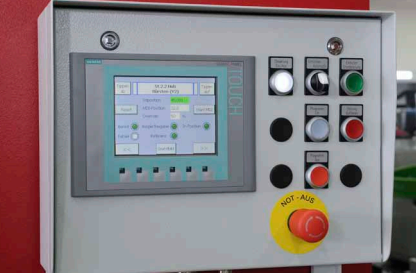 A well thought-out operating concept enables ergonomic handling and short training times. After programming for a cross-section for the first time, the data can be stored as a program and can be reloaded at any time. After the program has been selected, the machine automatically sets itself to the saved parameters. The change to a different cross section can be made within seconds. Automatic feed via cross conveyor belt.